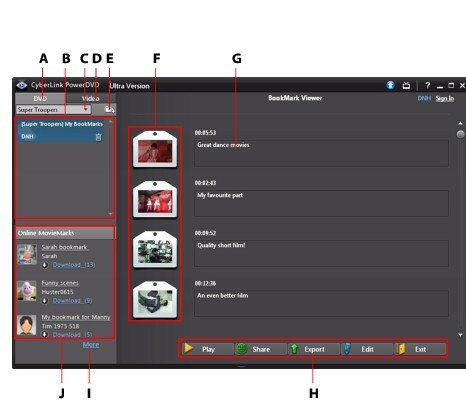 During the playback of DVDs and videos, select to bookmark your favorite scenes and gain access to the BookMark Viewer. Click on and then select Add BookMark. Enter in a comment in the Comments field. The comment may be a description of the scene or a commentary/observation about it. Click on Save, or Save & View to view the comments at the bottom of the screen while the scene plays. In the BookMark Viewer you can view and edit all of the bookmarked scenes and associated comments for the current DVD or video you are playing. You can also export and share DVD BookMarks on MoovieLive or Facebook, or download and import more BookMarks for a DVD created by other CyberLink PowerDVD users. To open the BookMark Viewer, click on and then select BookMark Viewer. When you create a series of BookMarks for a DVD, they are packaged into a MovieMark and saved in your Movie Collection. See MovieMarks for more information. Click the DVD tab to view all the MovieMarks for the current DVD, or click Video to view all of your available video BookMarks. Note: some of these tasks are not available for video BookMarks. if required, select a different movie from the available list to view its BookMarks. The DVD for the movie must be in the drive to view the bookmarked scenes. select from the available MovieMarks in the MovieMark list view to view all of the BookMarks it contains. click on the Download link in the Online MovieMark list view to download additional MovieMarks from MoovieLive for this DVD. click on the More link to go to the MoovieLive.com to view and download more MovieMarks for this DVD. click on to import downloaded MovieMarks into the BookMark viewer. double-click on a specific BookMark in the main window to play it and view the associated comments. click the Play button to play all of the BookMarks in the current MovieMark in order. Click on Share to upload all of the BookMarks to MoovieLive and Facebook, packaged as a MovieMark. Click on Export to save the BookMarks in a MovieMark file on your hard drive. Saved in the .BMK format, you can import it into another computer or e-mail to friends. Click on Edit to edit any existing BookMark comments. Click Save to save your changes, or Cancel to discard the changes. Click on Exit to close the BookMark viewer and return to the DVD or video. To delete a specific BookMark, click on the Edit button and then click the button next to the BookMark you want to delete. To delete a MovieMark from the list view, select it and then click . When you play a MovieMark or individual BookMark, CyberLink PowerDVD starts the playback from the bookmarked point and displays the comments below the video image. CyberLink PowerDVD continues the playback of the movie from the point where it was bookmarked. To view the another BookMark, select one from the sidebar on the right. Click on Exit to hide the BookMarks and comments, or just to hide the comments.